I swear there is a classic cocktail with this (or very nearly this) recipe, but I can’t remember what it is for the life of me, so I’m just going to call it a gin daisy. After I had the good fortune to acquire a bottle of Clement Creole Shrub, I felt a strong impulse to make a drink that would highlight this marvelous liqueur. Gin is often the most unobtrusive spirit when you need a modifying flavor agent to take the front seat, so I decided to make a gin Daisy. A daisy is simply a sour in which the sweetening agent is a liqueur instead of a syrup, and it is generally served up. To insure the proper balance, we built this drink iteratively, tasting every element as it was added. This process is essential when mixing with unfamiliar ingredients, but sometimes it can take you in an unexpected direction. After building the basic sour, something was missing, so we added a quarter ounce of dry vermouth, and it contributed the exact flavors and complexity that the drink was missing. Shake over ice and double-strain into a cocktail glass. Garnish with an orange wheel. I confess, my orange wheel was having some structural integrity issues, but it made a good enough photo, and still served the essential purpose of contributing fresh orange notes to the aroma of the drink. Gin Daisies are highly underrated in my opinion, and a great way to beat the heat. 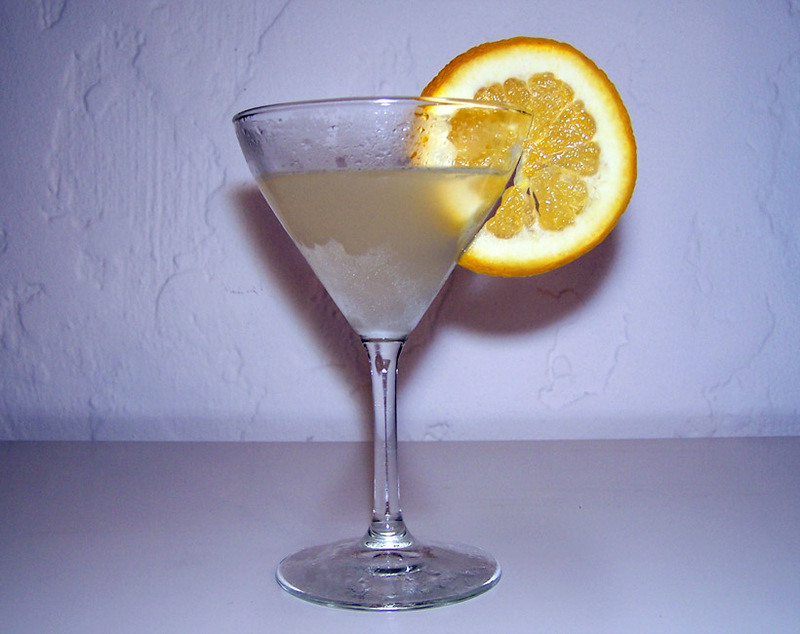 Categories: classics | Tags: booze, clement creole shrubb, cocktail, cocktails, curacao, daisy, drinking, drinks, dry vermouth, gin, hayman's, lemon, mixed drinks, old tom gin, orange, orange liqueur | Permalink. Perhaps an orange wheel engineer is needed? Anyway, is the drink you were thinking of the Snake In The Grass?